V3KT is a morphing vector mixer/quadraphonic panner with CV logic outs. Add vector synthesis, vector mixing, dynamic signal distribution, and quadraphonic panning of signals + CV sources to your synthesizer in just 6hp! Use LFOs, envelopes, sequencers, controllers, etc. 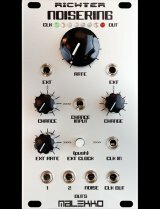 to control the V3KT to generate unexpected patch animation from otherwise stale mixes. Upgrade your joystick/XY pad to a multi-function vector processor/controller! Combine various sources (synth voices, drum machines, radio, samples, spoken word, etc. ), to create experimental morphing mixes. Create quadraphonic signal panning for surround performances. Distribute a signal to 4 separate effects (distortions, delays, filters, etc. ), at modulated levels. Morph 4 oscillator waveform outputs to reproduce vintage vector synthesis techniques. Use as a CV re-distribution continuous logic center to re-imagine your existing CV sources. Utilize multiple inputs and outputs simultaneously in all modes to create complex, interactive patches. Quadraphonic panning/distribution: Insert source signal to center input channel to distribute to the 4 corner output channels. Vector mixing: Insert source signals to 4 corner inputs to mix them to the center output channel. 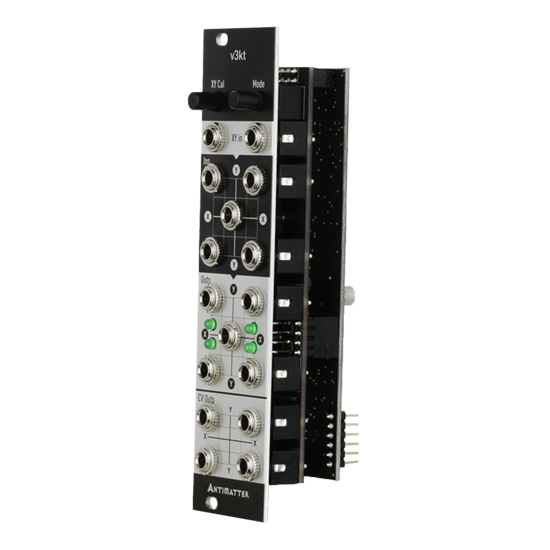 The 4 CVs that control the internal quad VCAs provide continuous logic modulation sources via the bottom 4 output jacks to control other modules within your system. Combine various sources (synth voices, drum machines, radio, samples, spoken word, etc.) to create experimental morphing mixes. Distribute a signal to 4 separate effects (distortions, delays, filters, etc.) at modulated levels. 8 High-quality VCAs + amps: for a clean signal path. DC-coupled signal path: The V3KT can process multiple CVs and become a hub of CV processing in your patches! Reverse power damage resistance: Helps protect the V3KT from reverse power connections. Automatic memory state saves for calibration and mode. All ins and outs are available in all modes to invite experimentation, feedback, etc. LED output indicators to easily monitor the current vector plot position. Dedicated outs for control signals, use to control other aspects of your patch or use with VCAs or a VC mixer to create a parallel vector mix or distribution/pan!